I must confess! I got side-tracked this week and started something new, again! I've been toying with the idea for this design for quite awhile, and I wasn't in the mood to do any applique, so I decided to get it started. What can I say, I have a short attention span! LOL It's always fun beginning a new project, pulling and playing with different fabrics, until you get just the right combination. Here's a sneak peak. This part is only glued, ready to sew, so I don't know when I'll be able to show you the whole thing, as I really need to be disciplined and get back to the Vintage Tiles. I want to have it finished, ready for quilting, sometime in September. I thought I would have a lot of sewing time when DH and DD were in Scotland next month, but last night we found out that Zoom Airlines has stopped operating, and all flights have been cancelled. Hopefully we will recover the money we paid for their fares, it's in the hands of the credit card company now. We checked the other airlines this morning for available seats but they all seem to be sold out for September. I have a very disappointed family right now. We'll have to see if they can reschedule their holidays and maybe go over in October. Have a good weekend everyone. Bye for now. Sorry you have to postpone your trip! 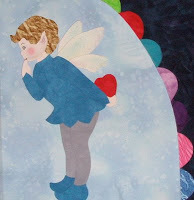 The little winged fairy is so sweet!!!! That fairy is so cute! I'm always jumping from one project to another, but try not to feel too guilty about it, I (almost always) go back to them at a later date. Sorry to hear about the flights that were cancelled. Oh Dorothy! I am so sad that your family have been caught up in the Zoom airlines crash. How very disappointing for your husband and daughter. I hope the CC company will refund the money so that they can reschedule the trip.